Many people know Galagal and its significant usage in our Spicy Soups ( Tom-Yam). 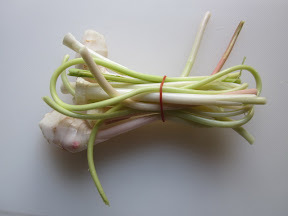 But we also use the young root and stalk of Galagal as a Vegetable in steaming with fish. It is also is used in many other dishes. Young Root spreads underground in rainy season and the stalk will break up from the earth in red brown color. When they reach about 40 cm above the ground, you will see their first leaves. We harvest the young root and stalk. Then we will peel off reddish colored stalk, leaving only the greenish white young inside, which we can use in cooking. Apart from the young stalk, we also love to eat the orchid-like flower of Galangal. We take the young pot of the flower that appears on top of the matured stalk and eat them fresh with chili sauce or sometimes steam them with the Fish. The taste of the flowers is similar to the root, but it has the after-taste almost similar to the Japanese Wasabi.